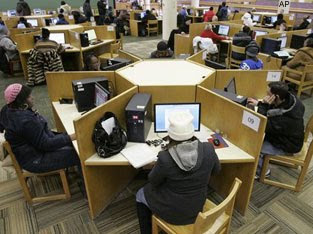 13 Above: US Jobless Rate Jumps To 9.7 Percent !! The unemployment rate jumped to 9.7 percent in August, the highest since June 1983, as employers eliminated a net total of 216,000 jobs. The economy is showing consistent signs of improvement, but probably not enough to stop employers from cutting jobs or to keep the unemployment rate from rising. The Labor Department is expected to report Friday that the jobless rate increased to 9.5 percent in August, from 9.4 percent in July, as employers cut 225,000 jobs. The employment report will follow other recent data that shows the economy is pulling out of the worst recession since World War II. A trade group reported Tuesday that the manufacturing sector grew in August for the first time in 19 months, while home sales have increased for several months. But the economy isn't expected to grow strongly enough this year to persuade companies to ramp up hiring. Most economists expect the unemployment rate to top 10 percent by early next year. "We have a very long, painful healing process ahead," said Bruce Kasman, chief economist at JPMorgan Chase & Co. "The good news is we're starting it, the bad news is we need much faster growth" to bring the employment rate down. A loss of 225,000 jobs would be the smallest monthly decline since last year, a sign that layoffs are easing. Employers cut 247,000 jobs in July, compared with an average of 691,000 per month in the first quarter. Still, the job cuts are holding down wages and salaries, while credit remains tight and home prices and stock portfolios have fallen. All those trends are restraining consumer spending, which makes up 70 percent of the U.S. economy, and could weaken the recovery. Most retailers posted sales declines last month as shoppers limited back-to-school purchases to focus on necessities. Discounters did better than upscale chains, but the results Thursday raised further concern about the upcoming holiday season. Other economic news on Thursday was mixed. The Institute for Supply Management, a trade group, said the service sector inched closer to growth in August, but still contracted for the 11th straight month. The ISM's services index, which covers hospitals, retailers, financial services companies and more, rose to 48.4, up from 46.4 in July. Still, readings below 50 indicate the sector is shrinking. In a separate report, the Labor Department said the number of laid-off workers applying for benefits dipped to 570,000 last week from an upwardly revised 574,000. That was a weaker performance than the drop to 560,000 claims that economists projected. The number of people receiving jobless benefits totaled 6.23 million, up 92,000 from the previous week, which had been the lowest level since April. 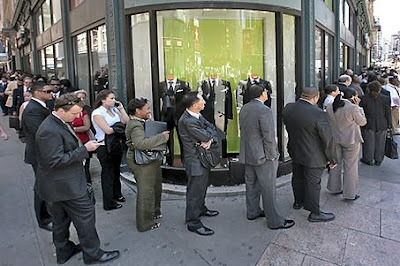 Economists closely watch initial claims, which are considered a gauge of layoffs and an indication of companies' willingness to hire new workers. First-time claims have trended down in recent months and are below the recession's high of 674,000, reached in the first week in April. But even with the improvement, they are running at levels well above the 325,000 mark considered a sign of a healthy economy. Federal Reserve policymakers said in minutes from an August meeting, released Wednesday, that they expect the economy to recover in the second half of this year. But labor market conditions are still "poor," the Fed minutes said, and many companies are likely to be "cautious in hiring" even as the economy picks up. Many economists credit the Obama administration's $787 billion economic stimulus package of tax cuts and spending increases, along with the Cash for Clunkers program, with helping spur the recovery. But they worry about what will happen when the impact of the stimulus efforts fades next year. Vice President Joe Biden issued an upbeat report card on the economy Thursday, saying that the massive stimulus program had been more effective "than we had hoped." Still, consumers are not spending enough to boost retailers' bottom lines. Discounter Target Corp. and warehouse club operators Costco Wholesale Corp. and BJ's Wholesale Club Inc. said Thursday that sales at established stores dropped. A 5 percent jump at TJX Cos., which operates discount chains TJMaxx and Marshall's, topped expectations. But upscale retailers, including Saks Inc. and Nordstrom Inc., reported a weak month. On Wall Street, stock indexes rose. The Dow Jones industrial average added about 64 points, as broader indexes also edged up. More job cuts were announced this week. Washington-based manufacturer Danaher Corp. said it will lay off about 3,300 of its roughly 50,000 employees, an increase from the 1,700 cuts it announced in the spring. American Airlines said it is cutting 921 flight attendant jobs as it deals with an ongoing downturn in traffic and lower revenue.